>> Breadcrumb :Home/Audio news/Stereophile/“The Big Raidho Room in the EXPO Hall” . . .
“The Big Raidho Room in the EXPO Hall” . . .
. . . proclaimed posters everywhere on the Renaissance Convention Center’s ground floor. 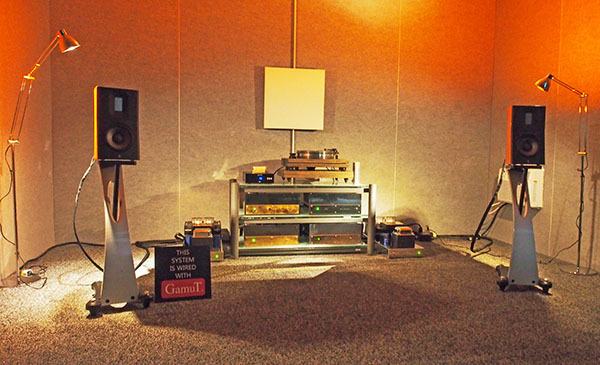 It turned out that the show had run out of exhibit rooms, so a purpose-built listening room had been built for Chicago dealer Kyomi Audio at the back of the big hall that housed the LP fair, the Master Class space, and the Ear Gear exhibits. Inside—forgive the grainy photo; it was quite dark inside this room—were a pair of Raidho TD1.2 stand-mounted speakers ($27,000/pair) connected with Gamut Reference cables to a pair of Jadis NEC 845 push-pull monoblocks ($29,990, the first pair in North America), a Jadis JPS2 preamp ($15,500), and a Jadis JPS3 phono preamplifier ($14,900). The Danish company Raidho has been bought out by another Danish company, Gamut, and the TD.12 is the first fruit of the relationship. [Technically (as commenter “chronoglide” has pointed out, Gamut is a brand of the company Dantax A/S, which now owns Raidho as well. – ed.] Re-engineered by Gamut head of design Benno Meldgaard, the new version of the Raidho speaker has a woofer with an underhung, 1.2 Tesla magnet system and a revised ribbon tweeter with, I was told, distortion 35dB lower in level. The sound on an Analogue Productions reissue of a Norah Jones album played on a Pear Audio Blue Kid Thomas turntable with Comet 2 tonearm ($7995) fitted with an Ortofon Cadenza Black cartridge ($1995) gave no clue that this was a temporary room. The system sounded rich and detailed, with superbly transparent high frequencies. However, I had to leave after two tracks because the tubed Jadis amps were heating the room up too much for this fragile New Yorker.